In the unit that sleeps up to 5 guest you can feel SUPER COMFORTABLE with the BEACH FRONT view!! Find FREE WI-FI!! All leather sofa and love seat. In the bedroom you can find a King size bed with pillows on top mattress for 2 people, in the living room 2 more guest can sleep comfortable in the queen size pullout sofa with memory foam mattress. And if one more guest decides to come with you, don't worry they can use the twin roll-a-route bed in the master closet. Additional covers and pillows. A brand new 50” flat Smart TV (internet available/bring your X-Box) and DVD player in living room and shiny new 40" screen Smart TV in bedroom. Cable television; in our unit you would find beach chairs, pool/beach toys, umbrellas and beach towels for your use. Completely equipped kitchen with refrigerator, stove, electric stove, microwave, dishwasher, toaster, coffee maker (we supply the filters) all the pots and pans that may need to cook a great dinner and last a commercial blender for all your frozen margaritas. In the bathrooms you can have easy access to the hair dryers and make up mirror. Don't worry about taking dirty clothes back home used the washer and dryer that the unit provides. Walk out through the balcony doors and breath that salty ocean air, and delight your view and watch the Sea of Cortez. 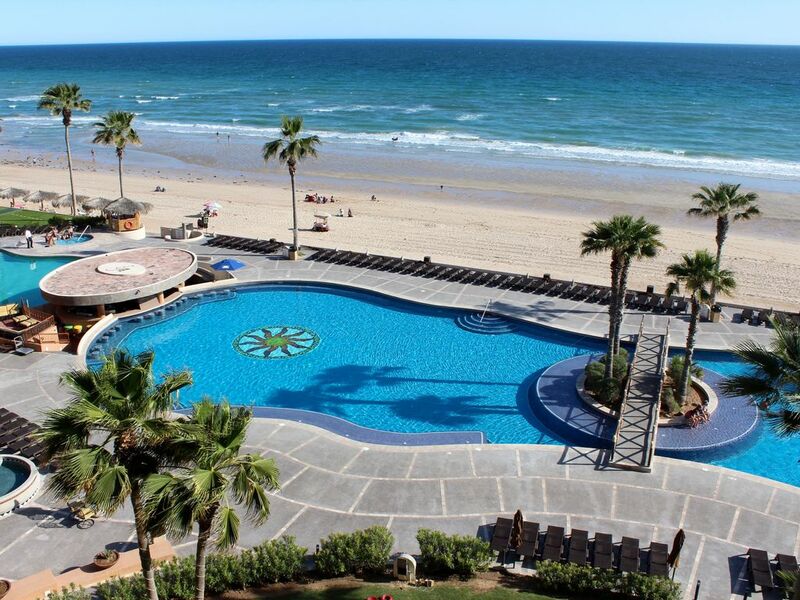 We just loved to visit Peñasco as much as we can and for that we like to provide everything that you and your family may need to enjoy your vacations, This means that this unit is "owner used" condominium , so you know when YOU come, it will always be up to date and taken care. Convenience store, gym, BBQ's grill, Jacuzzi and tennis court. COME AND OPEN YOUR PATIO DOOR TO PARADISE!! If you are looking for a resort that is the best in comfort and extravagance condominiums, Sonoran Sun is your answer! You will welcome the ocean front pools, swim up bar or the onsite restaurant. Take advantage of the beach and enjoy the sand. On the other hand you can relax by the wonderful blue pool and swim up to the bar for a beverage while you take in the serene sea views. Don't stress more and come enjoy that vacations that you need. Paradise is awaiting for you, get in contact with Casago Reservations and check availability and prices.